This ultra-slim I2281FWH 21.5" 16:9 LCD Monitor from AOC features a reduced bezel design so you can focus on what's on the screen. The display supports a Full HD 1920 x 1080 resolution, a 1000:1 contrast ratio, a 250 cd/m² brightness rating, and a 4 ms response time to provide a clear picture with enhanced clarity. Setup is simple as the AOC I2281FWH monitor comes equipped with both HDMI and VGA inputs. Viewers can even connect a pair of headphones to the built-in audio out port for a complete multimedia viewing experience. Additionally, this monitor features an IPS (In-Plane Switching) panel that supports 178° horizontal and vertical viewing angles as well as the ability to tilt from -3 to 20° for enhanced viewing comfort. This display comes with an advanced IPS panel, which produces enhanced colors and offers wide viewing angles. This way, images always look accurate, regardless from which angle you - or your friends and co-workers sitting or standing next to you - are looking at the screen. Want to watch a Blu-ray movie in full quality, enjoy games in high resolution, or read crisp text in office applications? Thanks to its Full HD resolution of 1920 x 1080 pixels, this monitor lets you do just that. Whatever you are viewing, with Full HD support it will be displayed in rich detail without requiring a high-end graphics card or consuming a lot of your system's resources. Box Dimensions (LxWxH) 22.0 x 20.0 x 4.0"
I2281FWH 21.5" 16:9 IPS Monitor is rated 4.3 out of 5 by 12. Rated 5 out of 5 by Johnny from Perfect! The ordering process was super easy. The monitor I purchased was my first AOC monitor and it is incredible easy to set up and get working... as in "totally plug-and-play". All the proper cables were included in the box and the box was packaged in such that the monitor was perfectly protected for shipping. For a low-priced monitor, I couldn't expect a better one - sharp, crisp image quality and ease-of-use (no weird hold this button and hold that button to change resolution, etc). This is not a gaming monitor, just a general-use monitor, so I cannot state how well it works for high-speed graphics, but for normal computer use, it's all I need. Rated 5 out of 5 by Aram from AOC I2281FWH - Good Stuff Great monitor if you dont need dvi input. Not sure exactly what else to say about it tbh. It is very slim, very sleek and modern looking. It only has vga and hdmi for video input. I bought it because of its design and I also only needed hdmi so it worked out perfect. I really do like this monitor. When I purchased mine it was pre order and cost $89.99. That price was the lowest monitor available and by far one of the more aesthetically pleasing ones in any price range... Basically I only needed hdmi, it looked cool, and was only $89.99. A no brainer for me Im totally happy with it. A great buy. Highly recommended IF you only need either vga or hdmi. ...nice picture not missing any pixels it just plain and simple works (and looks) good (picture quality and form factor). Again highly recommended. Rated 4 out of 5 by Leigh from Great Value Monitor! 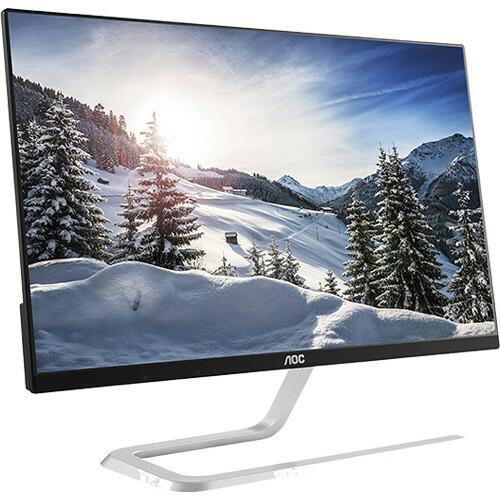 I was looking for an extremely cheap investment to implement a dual monitor system in my office at my start-up company and happened upon the AOC I2281FWH. If you're looking for a low-budget monitor for general online browsing and office use, I highly recommend picking at least one of these up. They were delivered quickly and in perfect condition, and I have yet to have any issue. The only thing I wish that this monitor could have had implemented is a USB port. Other than that, I stand by my purchase and thank B&H for getting me started as I continue to update my office. Rated 5 out of 5 by Poolpeople from Greatfor the price I bought two and use them side by side for my work. Very good color and contrast. I only use them for text and photos - no video. Very nice for the money. Rated 5 out of 5 by Arroz from Perfect The monitor is just what I was looking for and is even better than expected, which is amazing given the price! The AOC I2281FWH 21.5 16:9 IPS Monitor B&amp;H # AOI2281FWH does not support Vesa mounting. does this come with a power cable ?